“I don’t have all the Korean cooking ingredients to make a Korean meal,” is what I hear most often. Korean ingredients are easier than ever to find in the US and in other countries these days. Many of Korean ingredients can be found not only in Korean supermarkets but also other Asian markets. You can buy most of the basic ingredients at http://hmart.com/ in the US if you don’t have a Korean or Asian grocery nearby. Another thing I hear a lot is “there are too many ingredients that go into one dish.” Yes, this is generally true, but if you have the basic ingredients such as duenjang (된장), gochujang (고추장), gochugaru (고추가루), gukganjang (국간장) and sesame oil, you can make endless number of Korean dishes. The great thing about Korean dishes is that most dishes use similar ingredients in different portions. Depending on the portions of spices and sauces, the flavor profile changes drastically, especially with different produces, meats and seafood used for different dishes. Moreover, Koreans are geniuses of storing food for a long time. Most ingredients and sauces last at least 6 months if not years if stored properly. So don’t be afraid to buy Korean cooking ingredients even if you are a novice Korean cook or do not cook Korean food often. In this page, I will introduce you to both fresh and dry Korean ingredients. I will also tell you how to store each item for the longest shelf life. Additionally, I will recommend brands I like and list places I buy my ingredients. Lastly, I will continue to update this page and add more ingredients as I believe that this page will contain the most useful information. Always look for “Made in Korea” or “Product of Korea.” The second choice is ingredients made in the US. Try to avoid Korean products from P.R.O.C. or China. There have been many reports that Korean products from China are not made with good ingredients or sanitary factories. I Like the following brands; Pulmuone (풀무원) and Chung Jung Won (청정원). If you find a NongHyup or NH mark, this is a great find as well because Nong-Hyup (농협) is a government sponsored organization that helps Korean farmers in various ways. I always buy products with this seal because it not only means the product is from Korea but also guarantees its quality. I like Chongga (종가집) for kimchis and packaged banchans (side dishes). Ottogi (오뚜기), Bek Sul (백설), Sempio (샘표) and Haechandel (해찬들) are good Korean brands as well. Looks matter; the prettier the color and shape, the better the ingredient as long as it is all natural. For example, gochugaru that has a brighter red color is generally better. There are many organic options for Korean ingredients these days, which is great news. Look at the expiration date even for dry ingredients. Let’s start with must-have 5 Korean ingredients. Believe it or not, you can make virtually every Korean dish with the five ingredients below but cannot cook Korean food without the ingredients below. So, if you are just learning how to cook Korean food or do not cook Korean food often, start with these ingredients. The ingredients below can be found in any Korean market or http://hmart.com/. There are different options such as fine gochugaru or extra spicy (매운) gochugaru. Buy the plain or basic gochugaru. If you need fine gochugaru you can always grind it in a food processor. Always look for gochugaru made in Korea. Also note that every gochugaru you buy will vary in spiciness so adjust your recipe accordingly. If you know your gochugaru is spicier than others, decrease the amount put in your dish. How to store: You can keep it in the pantry if you use it often and bought a small package. You can keep it fresher in the refrigerator or if you do not cook Korean food often, keep it in the freezer. Gochugaru lasts a year or so when kept properly. Gochujang is made primarily with gochugaru (고추가루). Consequently, gochujangs do very in spiciness like gochugaru. You can buy less spicy (덜매운) or hot (매운) gochujang. I buy the ones that say neither. Some say “Chapssal Gochujang (찹쌀 고추장, sticky rice gochujang)” or “Chal-Gochujang (찰고추장)” means that the gochujang is made with rice. This doesn’t mean much because all gochujangs are made with white rice or sticky rice so go ahead and purchase them. If you have children or family members who do not like spicy food, buy the less hot kind. 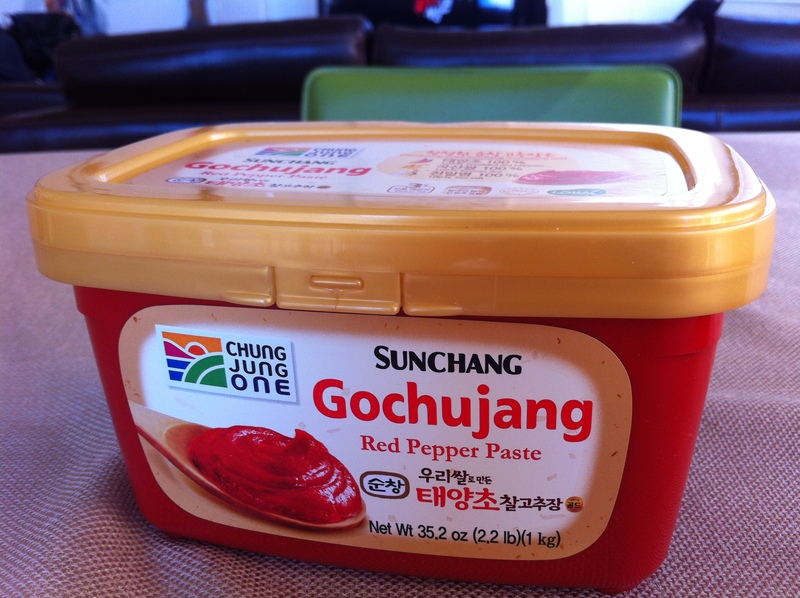 How to store: Store gochujang in the refrigerator once you open it. If you do not cook Korean food often, keep it in the freezer. Gochujang lasts at least a year when kept properly even if the expiration date says otherwise. 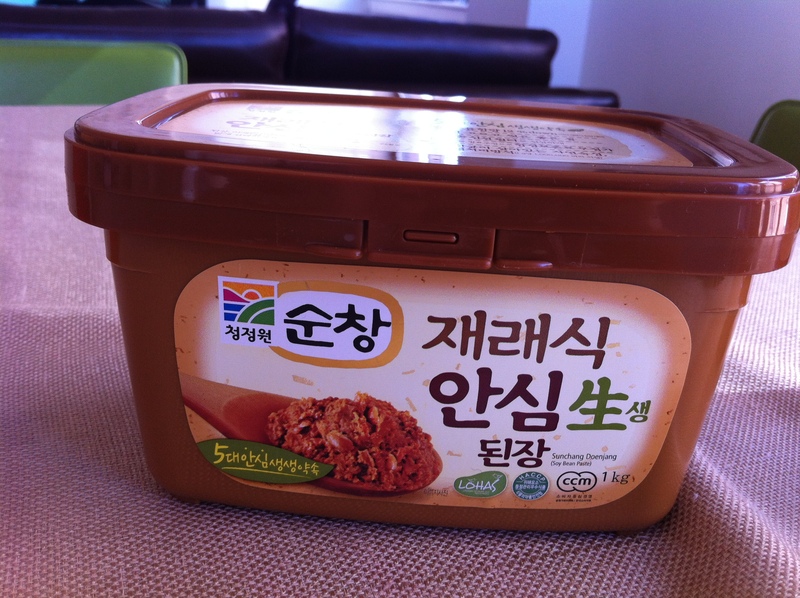 Soybean paste is unique to Korean dishes and is not the same as the Japanese miso. Homemade duenjang is hard to find outside of Korea. These last years and even taste better at it ages. Store bought duenjangs last a very long time as well and I keep mine in the refrigerator once opened. You can also keep duenjang in the freezer if you want to keep it longer. Gukganjang is different from regular soy sauce you find in Japanese or Chinese restaurants. 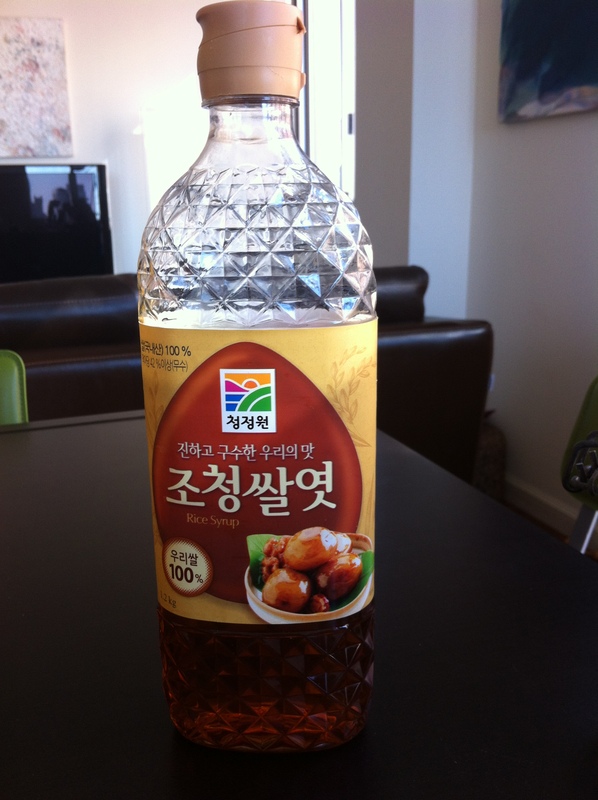 It is also called chosun-ganjang (조선간장, Korean soy sauce) and jip-ganjang (집간장, homemade soy sauce). Gukganjang is lighter in color and density but a bit saltier. 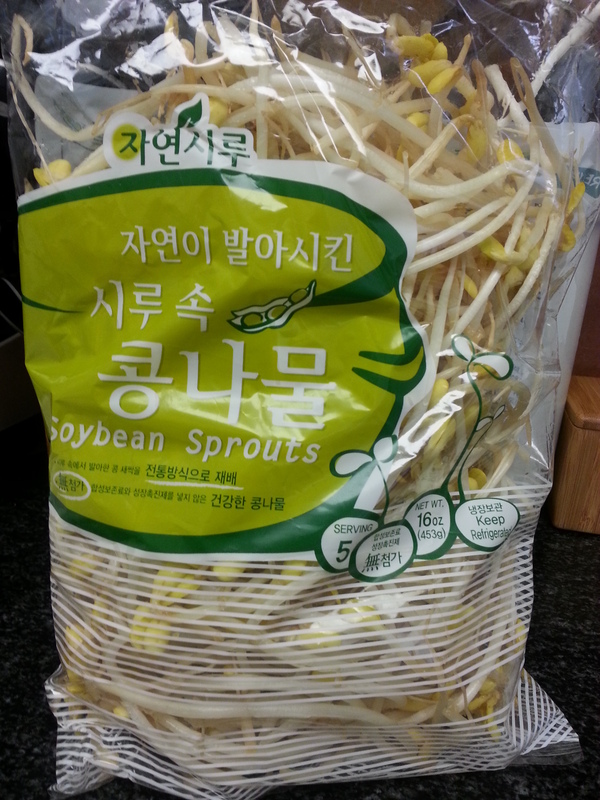 This is used in most banchans (반찬, side dishes) and guks (국, soups) so it worth buying it. If you do not have gukganjang you can substitute by adding less the amount of regular soy sauce than the recipe requires and a little salt. How to store: I keep mine in the refrigerator once I open it. 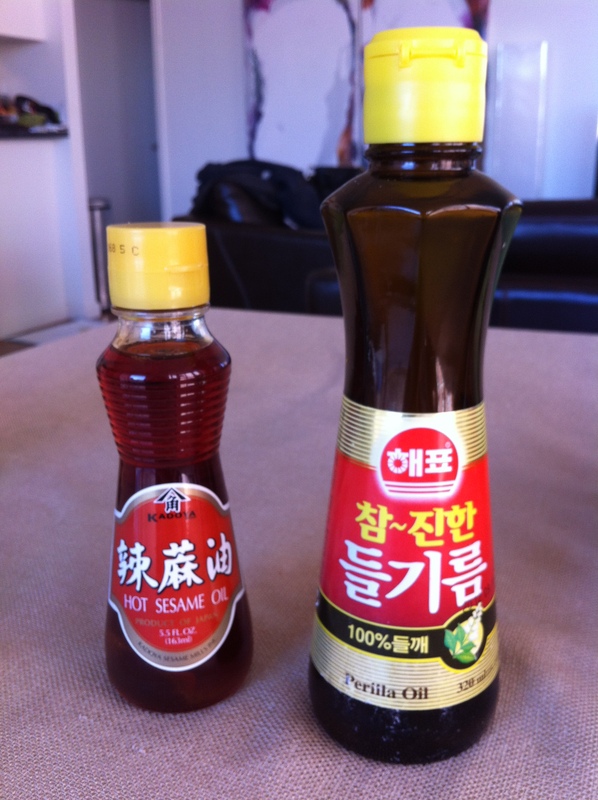 Sesame oil is widely used in Korean dishes along with vegetable oil. I honestly do not see much of a difference between the Korean brands and Japanese brands that you can see in your local supermarkets, such as Kikoman so go ahead and buy whichever brand you prefer. How to store: I keep sesame oil in my pantry away from direct sunlight and heat. Okay, now that we talked about the basic must-have Korean ingredients, I will introduce you five more Korean ingredients that are extremely helpful in enhancing the taste of your Korean dishes. These ingredients are not always necessary but will make your Korean dishes stand out. The ingredients last a minimum of 1 year except for the perilla seed oil, which is a little more delicate since it is an oil. Rice syrup is very similar to corn syrup except that it is made with rice. There are several kinds of Korean sweet syrups but I generally like to use jochung (조청), which is a dark colored rice syrup made naturally with rice. It does not go through a chemical process such as an artificial refinement process and is a sweetener that has been traditionally used in Korean cooking. Another option is oligodang (올리고당), which is oligosaccharide. This sweet syrup is lower in calories and consist a helpful bacteria called bifidobacteria that helps with digestion. The only problem is that the bifidobacteria is destroyed on high heat so oligodang is appropriate for dishes that do not involve high heat. If you do not have either, you can replace them with your regular corn syrup, but both rice syrup and oligodang is better for your health. How to store: Store it in the cabinet or a cool area away from direct sunlight. 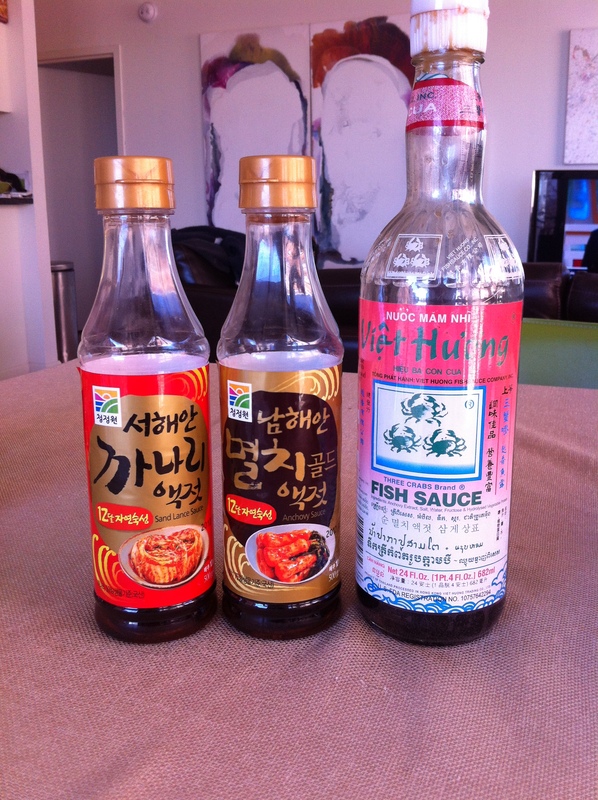 There are three kinds of fish sauces that I have in my refrigerator; myulchi-aekjut (멸치액젓), kkanari-aekjut (까나리액젓), and Viet Huong fish sauce. They are all very similar so you probably need only one kind. Myulchi-aekjut is made of anchovies and is probably the most commonly used fish sauce. Kkanari-aekjut is made with sand lance fish and is less fishy so if you prefer a milder taste, this is the one for you. Viet Huong fish sauce is a Thai fish sauce that can be found in any Asian grocery store. 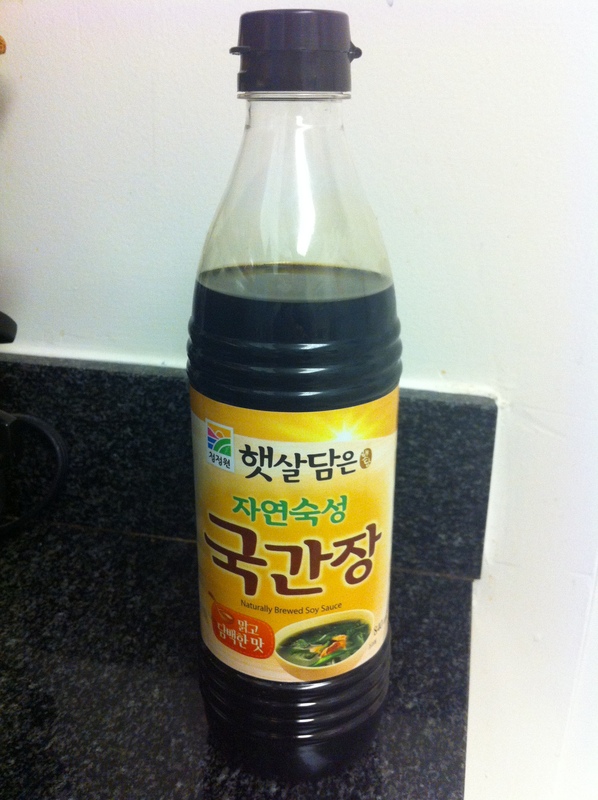 Koreans like this fish sauce to add a depth of flavor in soups but this is not appropriate if you are making kimchi. How to store: Store it in the refrigerator once opened. Maesilchung (매실청) is a sweet syrup made of Korean apricots aged in sugar, usually 50% apricot and 50% sugar. Do not get turned off because this is made with sugar. On the contrary, maesilchung is quite beneficial your heath because it contains a lot of vitamins, a great antioxidant, helps with digestion and hydration. It also helps prevent food from going bad and the spreading of harmful bacteria. Taste wise, it not only gives a fruity sweetness to the dish, it softens meat and gets rid of unpleasant fishiness in seafood. 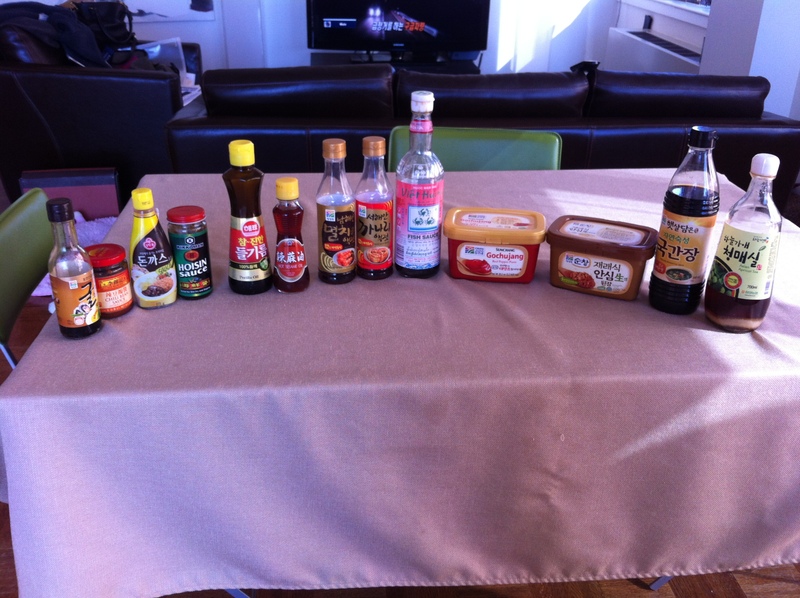 I use maesilchung in most of my marinades. Moreover, you can also drink this syrup as an apricot tea by simply adding water to it. Tips for buying: Look for the “NongHyup” signature. They are quite pricy (around $20-$25) if you buy the ones that are made traditionally with only apricots and sugar because it takes a long fermenting process. However, they last for over a year or even two in the refrigerator. Another option is to buy a much more affordable kind that is made with other additives such as artificial coloring and flavorings. I do not recommend this kind though. I find both sake and mirin pretty interchangeable in Korean cooking. You can buy an affordable sake in any wine/liquor store these days. Similarly, mirin can be found in most neighborhood supermarkets. 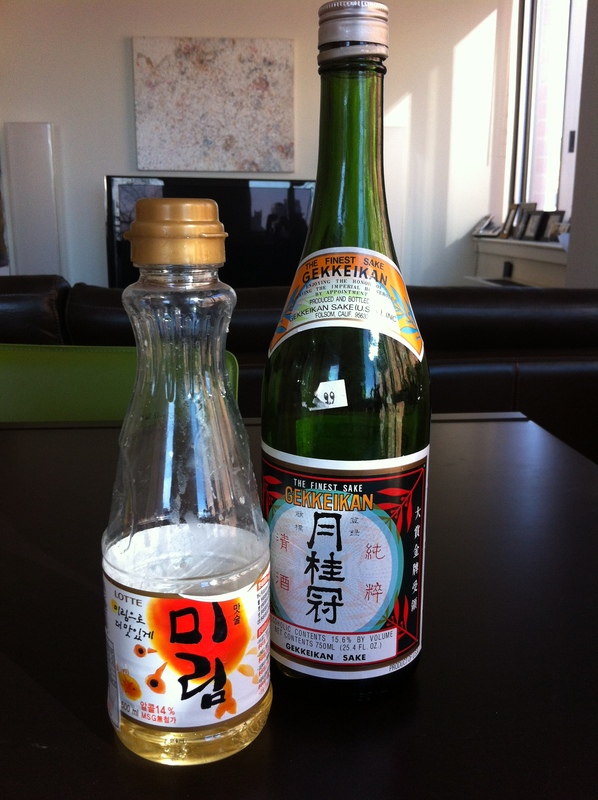 Generally, sake can be used universally and mirin is used in dishes that have a sweet component. Sake and mirin are usually used to get rid of any fishy or meaty smells in dishes. Perilla seed oil is similar to sesame oil but has a more earthy taste. 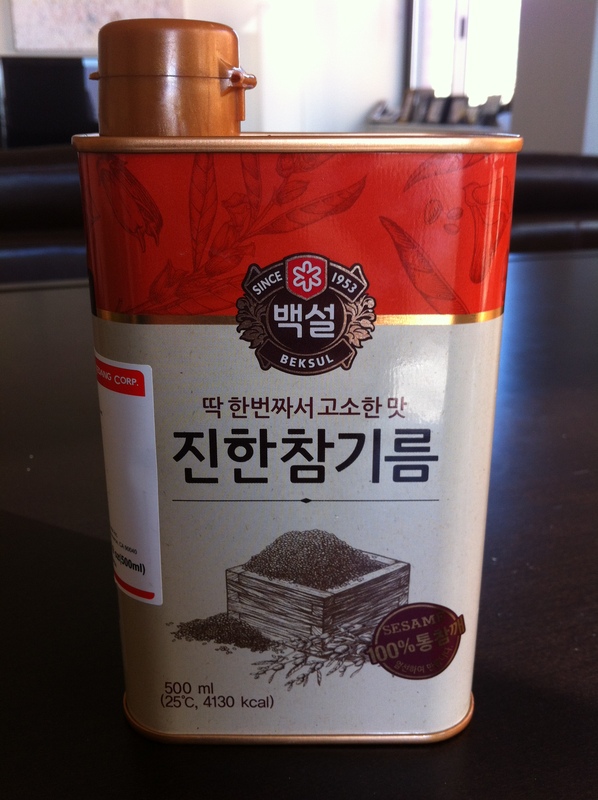 Traditionally, Koreans use perilla seed oil for sautéing vegetables, more so than sesame oil. 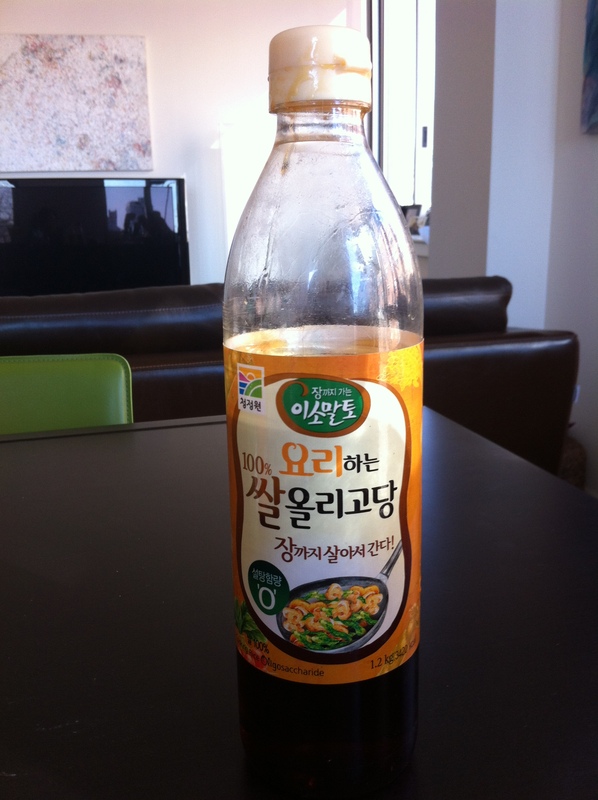 It is also great to use in Korean salad dressings. It is high in omega-3, helps prevent bad cholesterol and good for high blood pressure patients. The “holy trinity” of Korean cooking is garlic, scallion and ginger. However, there are other vegetables that Korean cuisine often requires, which I would like to introduce in this section. All five of the vegetables below can be found in most Asian markets and definitely Korean markets all year around. One of the most known Korean food is without a doubt, kimchi (김치). There are hundreds of kinds of kimchi made of various vegetables, with different combinations of ingredients and ranging in different degrees of spiciness. The most well-known kimchi is baechu-kimchi (배추김치) made with what is called “Napa cabbage” or “Chinese cabbage.” Koreans eat baechu both raw and cooked, used in soups, stews and as banchans (반찬, side dishes). How it choose: I simply look for freshness. Look for the ones with the outer green leaves intact if possible. How to store: Wrap it with paper towels (kitchen towel), then cover with a plastic bag or wrap. Store it in the refrigerator. Moo (무), which is a kind of white radish, goes hand in hand with baechu (배추). 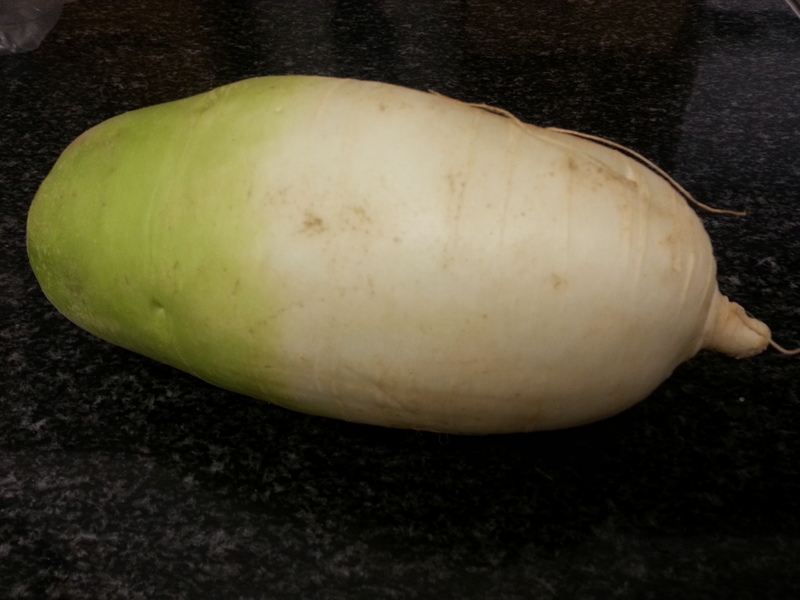 It is often called daikon, the Japanese equivalent although they are different in shape, size and taste. The Korean moo is rounder, shorter and crispier in texture than its Japanese cousin. However, if you can’t find the Korean kind, you can substitute daikons instead. I personally think moo is a more important ingredient because of it seems to be used in more Korean dishes. I always keep one in my refrigerator. How to choose: Look for one with no cracks and that is hard to the touch. Soft ones usually mean they are old. Kongnamul (콩나물) is my personal favorite. I use it in all sorts of soups and love making kongnamul-moochi (콩나물 무침) as banchan (반찬, side dish). Kongnamul is different from the regular bean sprouts which are called sookju (숙주). You can differentiate these two by looking at the tips; the one with the large round tip that looks like a bean is kongnamul, the one without it is sookju. How to choose: Kongnamul is usually sold in plastic bags. 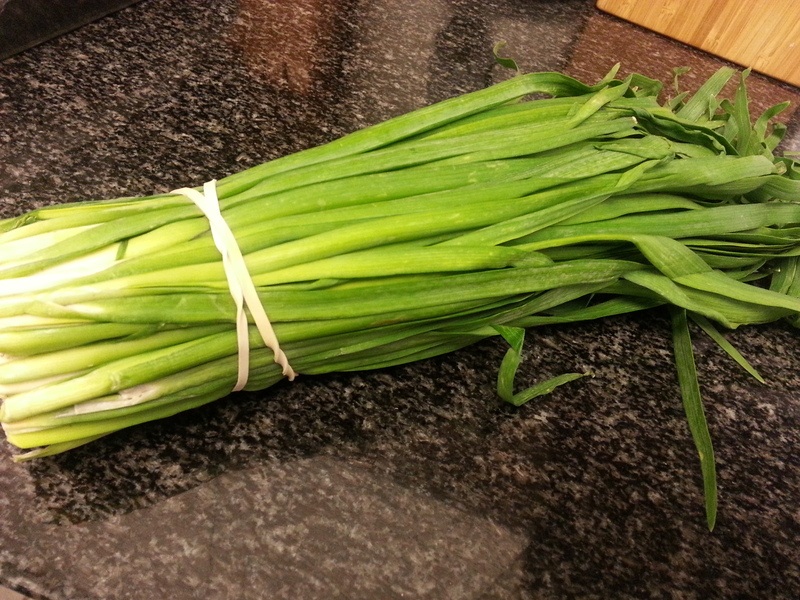 Look for the ones, which have white, crispy stems (not yellowish brown) and the ones with no liquid in the plastic bags. The ones you see with slimy juices mean they are old. How to store: Use it as soon as possible because kongnamul doesn’t last long in the refrigerator, probably 2-4 days depending on its freshness. If you are using only parts of the bag, store the leftover in a plastic container or plastic zipper bag with cold water filled almost but not quite enough to cover all the kongnamul. Keep some air in the container or plastic bag so they can breathe. Kketyip (깻잎) is a perilla leaf but sometimes are marked as a sesame leaf. 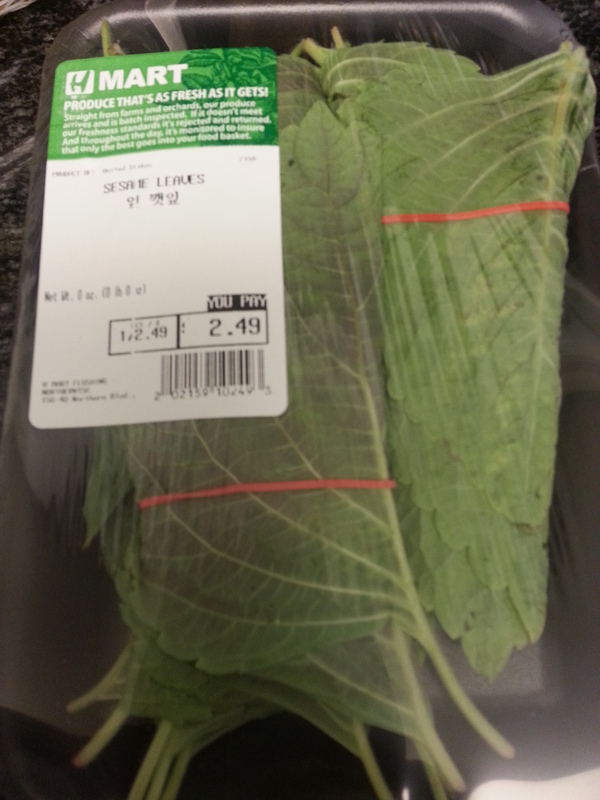 It is a fragrant leaf in the mint family, used as banchan (반찬, side dishes) and cooked in sautés, soups and stews. 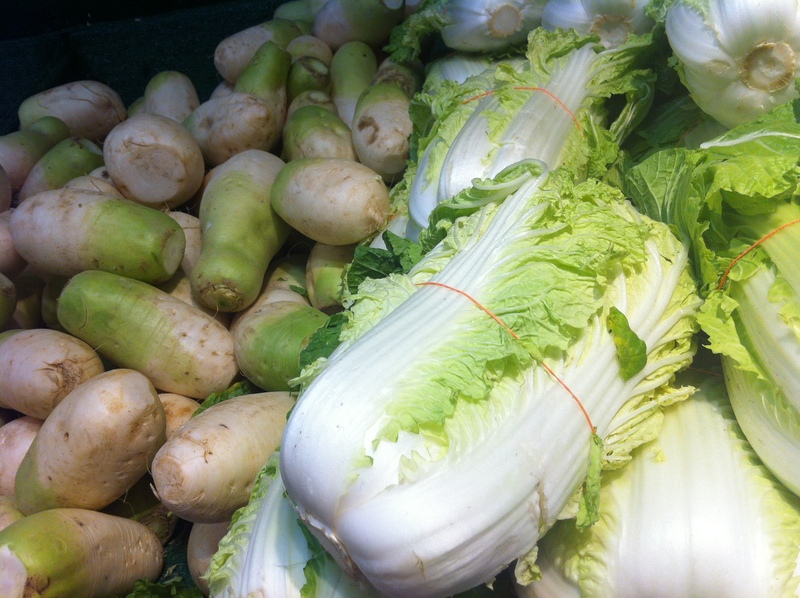 You probably have to go to a Korean market to find it because kketyip is a distinctively Korean vegetable. How to choose: Simply look for freshness. Buchoo (부추) is a Korean chive, used in soups, stews, Korean pancakes (jeon, 전) and dumpling, salads but more importantly, kimchi (김치). Korean chives are smaller and more slender in shape than the Chinese kind, but you can substitute it with Chinese chives if you cannot find the Korean version. I am allergic to sesame seeds/oil, can I substitute Perilla seed oil for recipes calling for sesame seed oil. Thanks! Yes, you can substitude perilla oil in place of sesame oil in most dishes, including salads, vegetable banchans (side dishes) and soups. The one exception I can think of are meat and chicken dishes such as Korean BBQs and galbi. For these dishes, simply use vegetable or olive oil instead. Thank you for your question! Is there a store bought brand of gochujang that is gluten free and soy free? Is it possible to substitute Gochugaru with Sunchang Gochujang because unfortunately I have no luck finding any in my local asian stores? So you have seafood allergies? There are many ways to go around seafood in Korean cooking. For example, if you find a recipe that uses myulchi (dried anchovy) broth, simply replace it with water, sagol-guk (사골국): Beef Bone Marrow Soup/Broth or Bausut, or Dashima Gukmul (버섯, 다시마국물): Mushroom, Dashima Broth (vegan). The broth recipes are on my site. You can also skip any recipes that use fish sauce and replace it with Korean soy sauce (guk-ganjang, joseon ganjang) and/or salt. Please let me know if there’s a particular recipe you have questions about or if there are any other concerns and I will try to help you to the best of my knowledge. Thank you! Hi. There’s no perilla leaf in my place. Is there anything i can substitute this with? I want to try the korean chicken dish that needs this. Thank you. I use to cook Korean all the time,all off a sudden I stopped cause my grand kids came along so I lost touch,my husband is Korean we eat Kaliningrad,bulgugi,seaweed soup and bean sprout soup,any recipit on line to get into,for sure if I see I get to cook again.now my husband dose the Korean cooking and I do the Canadian version thanks . I tried doing Korean dishes sometimes,and I got it all wrong, but now, I could do my homework correctly, and also help out my family on making and choosing from a variety of ingredients to make and enjoy together. I really appreciate this website. I come here often, and looking at this makes me happy.❤💖💜💕💛. 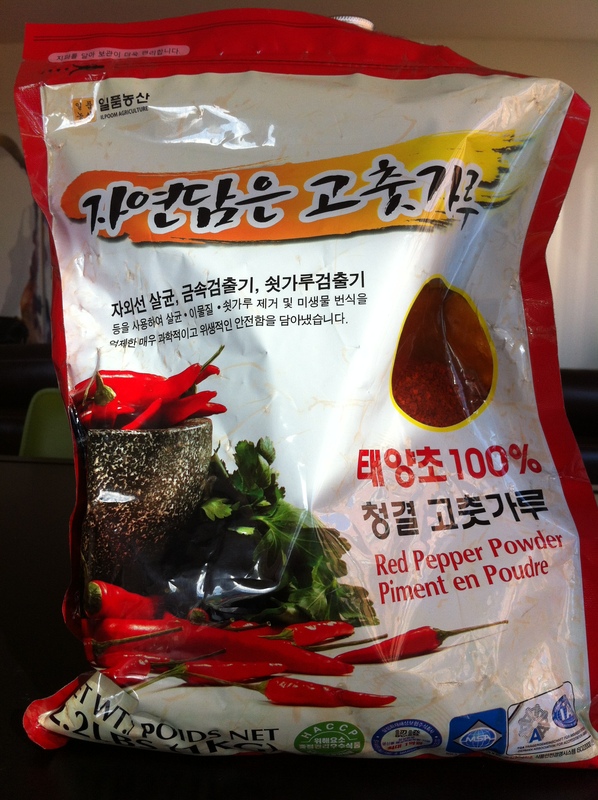 Do you have a recommendation on how to make spicy soup with the red chili paste? I apologize for the late reply.. Here are some suggestions from my recipes I have posted. I hope this helps and please do not hesitate to contact me if you have any further questions. Thank you! Two Korean stores here and they don’t even know what I’m talking about asking for organic or just say no, they have none. Neither does Amazon. Who has organic online??? Thx. It is more difficult to find organic Korean ingredients outside of Korea, but it is not impossible. For online options, hmart.com has some organic dry goods but the online selection is limited. I like brands such as Pulmuone and Chung Jung One, which have many organic options and usually use all natural ingredients. Perhaps it might be worthwhile to ask for those brands at the store. Also, many Korean brands that are organic have the USDA Organic marks on them. You may also ask the stores if they carry “you-gi-nong” products, which literally means organic. 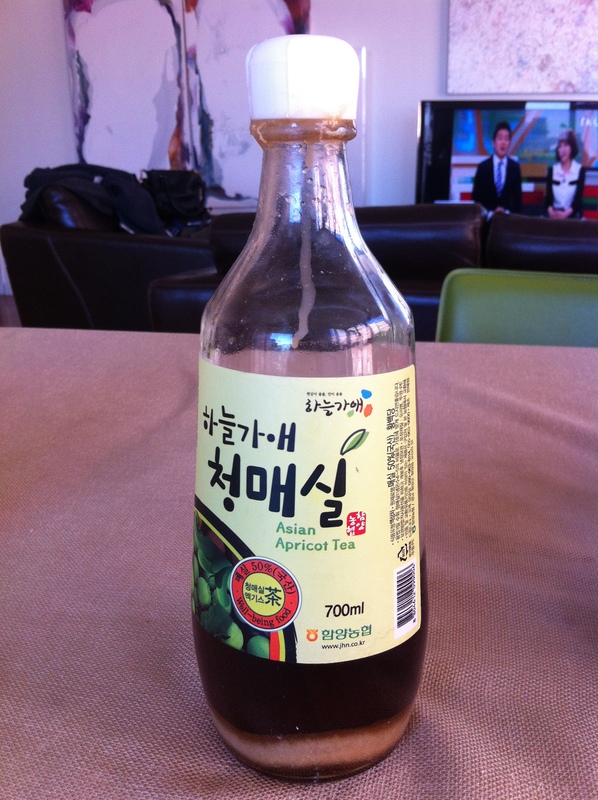 I hope you can help, is the Korean rice syrup GLUTEN FREE? I have just used it in gluten free cake but i just read on the internet that not all rice syrups are gluten free! i’m excited to make yukkgaejung (my husband’s favorite)! i’m korean-canadian and unfortunately i only learned how to make a few dishes from my mother before she passed away. i regret not learning more from her, because she was an amazing cook! your dishes look similiar to my mom’s cooking so i’ll give them a try. thanks for all the photos – it really helps to see them along with the recipes. i recognized the ingredients when i saw them but not from their names! I do wish I asked my mother how to cook more dishes as well. Please let me know if you have any questions and good luck!! !